Gameplay: This is a first person point and click game. The main menu shows New Game, Load Game and Exit. There is an option to change the resolution to 1024x768. The gameplay information is the seen on the first screen of a new game. Right click brings up the gameplay menu. The inventory bar is on top of the screen. Click-hold to take an item and drop it on the active place in the screen. Home: Look close at Carol's new sign on the door. Enter the apartment. Go to the Living room. Check the paper on the coffee table and learn that the apartment is now leased to Carol by Lovisa. Kitchen: Go to the kitchen and look at the dining table. Read the newspaper article by Ray Ivey and learn about Solvig Liedberg's haunted house. Go to the chair right of the telephone. Open the phone book and learn Solvig's address. Solvig Liedberg's House: Jump to Solvig's house using the map. Talk to Solvig and learn that she inherited the house from her parents. She gives mobile phone number and the house keys to the house so that Carol can investigate while they are away for 2 weeks on a Jamaican vacation. Katarina: Talk to Katarina and Carol mentions that she has to look for work. Kiosk: Talk to Stina. She shows Carol 3 designs for her agency's advertisement. Solvig Liedberg's House: Enter the gate. Front door: Go to the front door. Use the house keys on the door lock. Hallway: Go forward to middle of the hallway and hear a sound. Look for the sound and realize it is coming from the radiator at end of the hallway by the backdoor. Look close at radiator twice. There's a part missing. Living room: Go back towards the front door and turn right to the living room. Look around. Look at the pictures on the wall left of the entryway and right of the fireplace. Pick up the middle picture and look at the back - Arthur and Elizabeth 1944. Take the key behind the picture (hanging on the wall). Go left to the dining room. Look around. Turn back to living room. At the wall of the partition of the 2 rooms see an appreciation diploma for Elizabeth Liedberg from the Gatekeeper's Lodge Herb Garden. Study-office: Go across the hall and into the study. Look around. Look close at the table under the window. Use the key hidden behind the picture on the lock. Read a newspaper clipping about the death of Carl Bergsten. He designed this house. Take the gold radiator key. Study the pictures of the Liedbergs and the side of the house. The 1943 picture has 2 windows. They must have renovated. See a handheld puzzle with colored geometric shapes. It's missing 2 round pieces for the holes at each corner. Take the dowel piece from the drawer and place it on one corner hole the puzzle box. One more piece to look for. Kitchen: Enter the room at right just before the radiator. Read Solvig's note on the table. Look around at the pleasant kitchen. Turn around and take the mug left of the coffee maker. The clock on the wall at the corner seems to have stopped. Radiator: Use the mug at left end of the radiator. Insert the radiator key on the hole above the mug. Turn the key and see drops of water drip. Climb upstairs. Look around at different rooms. Sitting room: Enter the room left of the stairs before going down and across the bathroom. This is the room seen with the window on the picture. Exit the house. Katarina: Talk to Katarina about Carl Bergsten and the Herb Garden. Learn about the exhibit at the Museum of Design. Museum of Design: Take the upper path under the sign and enter the museum. Look around. Bergsten Exhibit: Turn right and forward to the Bergsten exhibit. Enter the room at right. Look around and read the information about the different exhibits. Turn left and see a monitor that needs a coin. Turn left from monitor. Go forward and then turn right. See a panel with squares on the wall. Squares memory puzzle: Look close at the square puzzle. There's a bypass for this puzzle. The object of the game is to click on 2 similar colors and shaped squares until all pairs have been clicked on. Have fun! Take the Handcraft exhibition ticket. See 4 geometric shapes at bottom of the ticket: red pentagon, yellow circle, blue pentagon and yellow pentagon. Handicraft Exhibition: Exit right of the monitor. Turn left immediately and climb the stairs at right. See the Handicraft Exhibition door. Look close at slot and insert the ticket. Look around the exhibits. Go forward until the blacksmith shop. Take the wooden dowel from under the cart's wheels inside the blacksmith shop. Exit the building via the main door. Solvig Liedberg's House: Enter through gate and house. Study: Enter the first door at right. Open the drawer. Use the dowel taken from the Handicraft exhibit on the last hole. Enter the colored shapes seen after completion of the memory puzzle at the Bergsten exhibit. From left to right: red pentagon, yellow circle, blue pentagon and yellow pentagon. A click is heard. Study the 1935 plans of the house. Take note of the 2nd floor plan. The games room now is the bathroom and one of the sitting room windows is removed. Sitting room: Go upstairs and enter the first room at right. Carol mentions about the windows after studying the floor plans. Kiosk: Talk to Stina completely. After seeing the diploma at the house learn that the Herb Garden is by the Green Bridge. Herb Garden: Enjoy a nice walk at the idyllic park. Go forward 8 times and turn left to a gazebo. Take the fishing rod. Go forward 3 times and see a nice resting area at right. Continue forward until the red building of the Herb garden. Enter the Herb garden. Turn left before the flag pole and see the gardener at side of building. Talk to the gardener. He can't let Carol check the books unless she's a volunteer. Herb signs: While facing the flagpole, look close at the herb box on the ground right of the flagpole. Take the herb signs on the gravel ground. Look close again at the herb box. Go back to the gardener and ask about recognizing the herbs. He gives cards with herb pictures to help identify them. Look close at each herb and place the signs. Talk to the gardener when ready and he allows you in the red building. Enter any door. Read the brown book and see that Elizabeth Liedberg was president only for 2 months in March to April 1944. The others are presidents for years. Automatically be outside. The gardener mentions that Simona is writing about the history of the garden. Simona: Exit the herb garden. Turn right and cross the bridge. Look at the manhole covers on the ground just after the bridge. Turn left, go forward once and enter the picnic area. Take the knife from the table. Continue forward until the red buildings. Enter the red buildings' yard and turn right to talk to Simona. Learn that Elizabeth and her husband socialized with the Nazis. She was pregnant when they left town. Turn right and go forward until the bridge (7x F). Cross the bridge and find the exit to the map right of the herb garden's fenced area. Sitting room: Climb upstairs to the sitting room. Look close at the display cabinet at right wall from the window. Secret room: Push the cabinet. Use the knife taken from the picnic area at the Herb Garden twice on the wall. See a door. Enter and see a table with candles. Read the book on Eugenics and the Independent Record newspaper. It's too dark on the left side. Exit the house. Library: Go forward to the computer. Use the mouse to look close on the monitor. Read about the Institute of Racial Biology headed by Herman Lundborg, a confessed Nazi. Solvig Liedberg's House: Enter through gate. See a note on the front door. Take the bill for work done by Mona and also the key. Storage room: Turn around from the front door. Go forward to the next building. Use the key on the padlock. Enter and see the storage area. Take the flashlight at right table. Outside building: Go to the building before the gate and beside the truck. Enter and look around. Enter the room at left. Take the 2 batteries from the table beside the vise. In inventory, combine the flashlight and batteries to get working flashlight. Secret room: Enter the house and back to the secret room off the sitting room upstairs. Use the working flashlight on the dark inner part of the room. See a made mattress on the floor. Look close at the mattress - hear a creaking sound. Check the magazine beside the eyeglasses, a candlestick and autobiography notes. Read the memoirs of Dietrich Gunter - Out of Time. Go to the door and hear that creaking sound again. Look down on the floor. Move the rug. See the floor board. It is the one making the sound when stepped on. Something is under there. Exit the room and the house. Read about Dietrich Gunter. Click on the left column about a German official found dead in lake. The body was found at Red Sun Lake not far from the old south watch tower. The forensics concludes that death was caused by inflicted violence. Read the next newspaper. Click on right column about the body in lake. Museum of Design: Do not enter the museum yet. Token: Take the lower path beside the water. Go forward until the gazebo like building. See a fence that overlooks the water at right of the building. Look down and see a coin below. In inventory, combine the fishing rod with the chewing gum. Use the fishing rod with gum on the coin below to get a token. Go back, forward and take the upper path to enter the museum. Go to the Bergsten exhibit at right. Forward to the monitor. Use the token on the slot. Press the pad on the shelf. Learn about the 3 buildings that Bergsten designed. St. Olof School was formerly the Institute of Racial Biology. Enter the building. Turn right after the doors and take the pencil left on the bench. Exit the building and turn right. Go around the corner and talk to the caretaker. Learn about the archives at the cellar. He is busy at the moment to help Carol. Mona Redvall: Look close at the gate's keypad. Keypad: Take note that 4 of the keys are darker in color than the rest. They are the ones used. The darker the color the dirtier they are too. Press 1 9 2 0. The green light is on. Talk to Mona. Learn that the father worked at the Institute of Racial Biology like Dietrich. There was no contact between the parents and Mona or her father who looked after the house before her. Go to the phone at the kitchen. Pick it up and click on any number to get hold of Solvig. Learn that there is an old clock that can't be opened. It is in a drawer in the living room. The drawer key is lost close to the left of the front door. Shrubbery: Look at the shrubs left of the front door. It must be in the grass here. Katarina: Talk to Katarina about her son's metal detector. Go to the dresser left of the bedroom. See an orange box on top of the dresser. It has 6 colored squares. Press a square and hear a tone. The box is sound locked. Look down and read the magazine - First Lesson. It has the strings of the guitar. Top to bottom on the left are D A E. Top to bottom on the right are G B E.
Go to the other side of the bed and to the computer table. Check the games at right. Pick up The Dark Eye and see a postit on Jack Orlando box. It has the code for the box: A - D - G.
Go to the guitar right of window. Play A D G: left middle, top left and top right. Follow the strings down and click on: second from left, third from left and 4th from left. Remember those notes-tones. Go to the orange box and press the squares that corresponds to those 3 notes. Press blue, yellow and green squares. Hear a click. Click on the handle to open the box. Take the metal detector. Shrubbery: Look at the shrubs left of the front door. Use the metal detector on the grass. Get the key from the grass. Formal dining room: Enter the house and go left to the living room. Go to the other room and look at the top left drawer of the hutch. Use the key from the grass on the keyhole. See a pocket watch. The date can be adjusted using the 2 knobs at top of the watch. Secret room: Go to the secret room upstairs again. Move the cabinet and enter the dark room. Use the flashlight on the dark area of the room. Go forward once, then turn around and look down. Move the rug off the floor board. Click on the floorboard or use one or 2 inventory items. We needs something else. Herb Garden: Enter the herb garden and go forward pass the flagpole until the end. Crowbar: Talk to the gardener that is fishing. Now that you tried opening the floorboard in the secret room again, borrow a crowbar. He says there's a crowbar at the water just outside the herb garden. Exit the herb garden. Just across the herb garden gate, look close at the water. See a hot spot close to the shore. In inventory, use the fishing pole and metal detector. Use the fishing pole with metal detector on the water and get the crowbar. Salvinia auriculata: Go back to the gardener and tell him you got the crowbar. He asks a favor in return - to get Salvinia auriculata for the birdbath. They grow in water and the Water Garden has them. Home: Go to the kitchen. Take a glass from the cabinet above the sink. Use the glass on the faucet to get a glass with water. Water Garden: Enter the water garden. Look around. Turn left and go forward twice. Turn left and look close at the sign of Salvinia auriculata. Pull back and take some Salvinia. In inventory, combine the Salvinia and the glass of water. If they are not in water, they will die in transit. Give the Salvinia in water to the gardener. Talk to him. Turn around to leave and he asks Carol out. Secret room: Enter the secret room. Use the flashlight, move forward once, turn around and then look down. Move the rug. Use the crowbar on the floorboard. See a journal that is locked with letter code. Read the letter at bottom left. Ah. Elizabeth is pregnant with Dietrich's child. Note that she is worried about the due date coming on the 16th of September. Exit the room. Pocket watch: Go back down to the formal dining room. Open the drawer and look close at the pocket watch that Solvig got from his parents. Open the back: Use the knobs on the top of the watch to enter the date that is important to Elizabeth - 16th of September: 16 on the left and 9 on the right. Turn the watch over. Now the cover can be opened. Open the workings of the watch: See 3x3 squares. The object of the puzzle is to remove all the squares. Numbering the squares left to right, top to bottom: Click on 8 3 1 2 6. See a picture of a boy. Click to open the back case. See another cutie pie picture. The watch had a Langer's Jewelry label and B398-40 etched on it. Langer's Gold: Go Home and look at the phone book at the kitchen right of the phone. See the address of Langer's Gold. Go to Langer's Gold. Talk to the man. He looks up the number of the watch. See the picture and order of the puzzle watch. It was ordered by Elizabeth while in Stockholm in February 7, 1949 and delivered March 11, 1949. Turn the picture over and see Adam Quilting 2 years. That must be the name of the baby in the picture. Adam Quilting: Go Home and look at the phone book at the kitchen right of the phone. See the address of Adam Quilting. Go to Adam Quilting. Ring the doorbell. Enter, turn right and enter the glass door. Talk to Adam Quilting. Learn about the death of Dietrich. he asks for a Pepsi. Exit the glass door and then through another glass door. See a blue glass with Equinox on it. Turn around and take a Pepsi from the fridge. Go back to Adam in the living room via another glass door. Adam gives a picture of Dietrich Gunter. Look at it in inventory. Turn it over and see the dedication: To Elsy and Arthur. Exit the room, left and exit to map. At the front door, hear footsteps. Enter the house and see the backdoor open. Exit the backdoor. Whoever it was is gone. Move the rug. Take the case. Enter the pet name of Elizabeth as seen from Dietrich's picture - ELSY. Read the letter. Take the envelope and open it. See a maze puzzle. 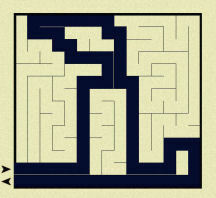 Maze puzzle: Click the pencil taken from St Olof's to form squares from the entry arrow to the exit arrow. Click on the maze paper and the squares coalesced to a solid line. Now what does that look like? Turn left twice and see what was drawn by the maze puzzle - the candlestick. Take the candlestick and see a drawing at the bottom of a clock showing 7:35. Take the intricate key under the candlestick. Mona: Go downstairs and talk to Mona. Learn about the car with Equinox on the side. Automatically go to the map. Go back to Solvig's place. Kitchen: Go to the clock that stopped by the table. Use the intricate key on the clock's hole. Click on a hand and both hands moves to 7:35. Nothing happened. Katarina: Talk to Katarina about Equinox. Learn about the New Age bookstore. Equinox: Look at the display window. Enter the store. Talk to the man about his car. Talk to Adam about the Equinox mug. Learn about his adoptive brother. Kitchen: Look close at the picture right of the fridge. Aha! Red clock: Turn right and forward to the window and right again to see the red clock. Look close at the clock. Go back and talk to Adam about the red clock. It belongs to his mother. Go back to the kitchen and red clock. Open the clock. Use the intricate key on the clock. Click on a hand and both hands moves to 7:35. Pull back, click on the blue base and see the bottom opens. Look inside. Take the map with an X right of a bridge. Go to the computer again and review the 2 newspaper clippings about Dietrich. He was found at the Red Sun Lake not far from the old south watch tower. After checking the library, talk to the caretaker. Oh my! He gives the envelope that dropped down from a dresser. Look close at the envelope in inventory. Open the envelope. See Dietrich's note and a strange card with square holes. Kiosk: Talk to Stina about the map and she recognized it as the place by the Docks. 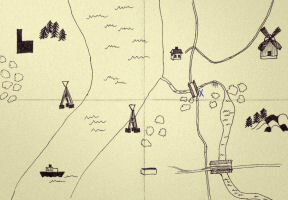 Docks: Carol marks the map with a red X as the starting point. Walk forward pass the barrier until the bridge. Before entering the bridge, look close at the right side of the bridge. See C2 written on the side. In inventory, combine the map and the strange card from St. Olof to get decoded map. Check that C2 is a tower close to the path. Click on C2 tower and Carol marks it red. X marks the spot: Turn around with the bridge on your back. Go forward 6 times. Turn right and enter the woods. Go forward 4 times. Turn right and go forward 6 times. Turn left and go forward 2 times. Turn right and go forward 2 times. See a tower. Look close twice at the base and see something hidden. Pull back twice. Turn left and see an exit sign. Solvig Liedberg's House: Enter through gate. Enter the first building by the truck. Take the shovel right of the doorway. Go forward 4 times. Turn left to the woods and go forward 4 times. Turn right and go forward 6 times. Left and go forward 2 times . Turn right and go forward 2 times. Look close at the base of the tower. Use the shovel 3 times. See a box. Open the box and see artworks that Dietrich stole. Local sleuth solves 60 year old mystery.